accepts orders and upsells/cross-sells customers directly in Messenger. 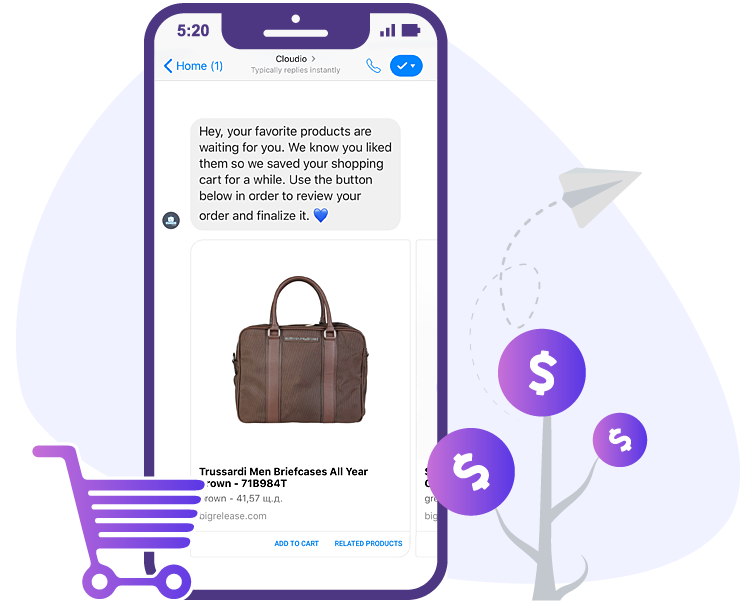 CloudIO is your personal facebook sales & chat bot assistant that will improve & automate your customer experience and sales performance beyond human limits. From promoting products & collecting shipping information to up-selling and cross-selling products. All done automatically in Messenger. NO MORE delayed messages between your business and customers that cause clients' disappointments and low sales. NO MORE human efforts to find and send the proper information, answer your clients questions and accept orders. NO NEED of money, time & technical knowledge/workforce to build personal chat bot for your business. NO MORE 3rd party chat bot applications that are not built specifically for your store or technical issues & lost revenue. CloudIO starts conversations by using advanced targeting & enrichment data, asking the right questions and immediately helping your customers by finding the information they need. 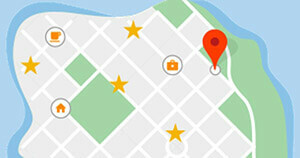 CloudIO is automatically integrated with your store and product catalog. You can easily set-up menus that match your needs & create sales/chat flows based on customer's behavior. 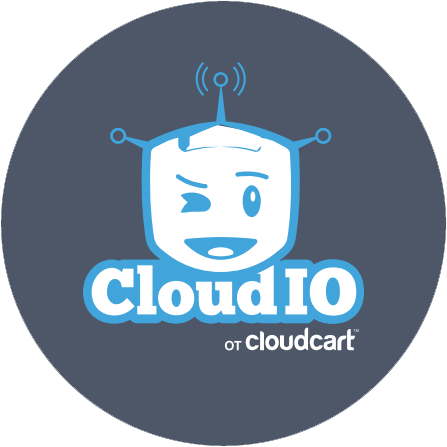 CloudIO is recovering lost revenue from Cart Abandonments, sends information about order status & upsells clients with complimentary products. CloudIO instantly finds the best information and answers all common questions from clients without any delays & slow response time. All done automatically. CloudIO helps you recover & turn your abandoned carts into sales by reminding clients in Messenger to come back and complete their initial order. CloudIO gives your customer the power to browse all products in your store and accept orders directly in Messenger by collecting users' data & shipping information. 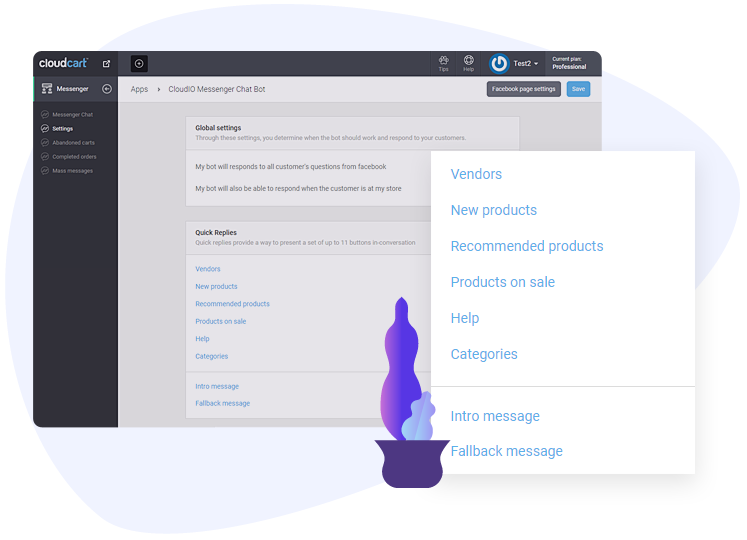 With CloudIO you can easily create chat & sales flows based on customer's behavior that upsell customers with complimentary products. CloudIO will send your customers instant message in Messenger when the status of their order has been changed and shipped to them. CloudIO allows you to send mass messages & reach every user that is subscribed to your page by delivering valuable content, sending promotions, or just asking for feedback.